It is the dream of many new investors to someday become financially independent from their portfolio. If you want to make a fortune from your investments, it helps to take a step back and survey your opportunities, both in terms of probable future income and life expectancy, as well as the different methods that are available to you in your quest to compound your wealth. In the United States, the lifetime earnings of a person with a bachelor's degree stand at roughly $2,100,000. Overwhelmingly, college graduates marry other college graduates, bringing that figure to $4,200,000. (From an economic standpoint, it's not a stretch to say that wedding rings are the new social status indicator and marriage patterns are not immune to assortative mating, which has some interesting, if not concerning, implications for income inequality.) As the CEO of your life, how you and your husband or wife allocate that money will have a tremendous influence on your household's ultimate net worth, passive income, and even happiness levels. This is especially true given the significant financial benefits of marriage. One of the biggest differentiators between those who end up living paycheck-to-paycheck and those who find themselves with a bank vault full of stock certificates pumping out torrents of dividends to enjoy is whether one has a tendency to buy depreciating assets or productive assets with his or her surplus funds. Depreciating assets are those that, once acquired, begin losing value. The quintessential example is an automobile. While it might provide utility, a car is one of the worst outlays you can make from a financial perspective. People who will never, in their entire life, have the foresight to say, "I'm going to buy a $50,000 block of Hershey and hold it for the next 50 years", "I'm going to buy $25,000 worth of Coca-Cola and, someday, put it into a trust fund for my granddaughter" or even, "I'm going to add $500 a month to my Exxon Mobil DRIP" will, instead, think nothing of going to a car dealership, buying a new car at 0% interest for $700 a month payments, and stretching it out over 60 months for something that is destined to be utterly worthless. Due to the nature of compounding, that first 10 or 20 years in the workforce creates outsized results so the person who was wise enough to begin acquiring cash-generating assets starts to break out and separate himself or herself from the pack. That ultimately turns into a gulf that is difficult, if not impossible to bridge. In other words, if you are privileged enough to be highly educated, married to another highly educated person, living in the most affluent economy in the history of human civilization, whether or not you end up financially independent - with few exceptions, such as a non-foreseen health crisis - is almost assuredly going to come down to your own ability, or inability, to manage your income with prudence. That simple truth, no matter how unpopular it may be to admit in polite company, is the reason minimum-wage janitors like Ronald Read end up being secret millionaires with $8,000,000+ and lawyers with prestigious resumes earning 1,000% more per year have a fraction of the wealth. You either employ your money, putting it to work for you, or you work for your money, selling your time (hours of your life, quite literally) for what you need that week. Nearly everyone starts out doing the latter but a fiscally wise man, like Read, ends up in a situation where his paycheck is much smaller than the dividends, interest, and rents he's collecting. What, then, is the recipe for getting rich? Do a few things right and it largely takes care of itself. Economic data leaves absolutely zero question that if you 1.) graduate high school, 2.) go to college, 3.) get married, and 4.) have children in that order as reporters and academics are fond of reminding everyone, your odds of ever falling into poverty are slashed to the point of being practically meaningless. It's the cheat code in the financial game of life. Take advantage of it. Any deviation stacks the deck against you in a powerful way. There is no getting around it. There is no denying it. The evidence is irrefutable and the data set gargantuan. Always live below your means even if you're just saving a small amount of money. The discipline it builds is a good life skill to have that will pay off elsewhere, too. Put that surplus to work in the most tax-efficient way you can. For most people, this is going to be a twin combination of a Roth IRA and Roth 401(k). Established correctly, you can probably avoid paying taxes on most of your investments for the rest of your life. 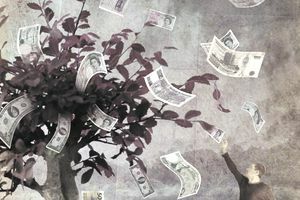 If you are fortunate, and/or disciplined enough, to reach the maximum contribution limits each year, begin building up assets outside of tax shelters that can take advantage of the stepped-up basis loophole when you die. That will permit you to pass on those assets to your children and grandchildren without ever triggering the capital gains tax. All of your deferred tax liabilities are forgiven. Avoid debt whenever possible, especially credit card debt and student loan debt. When you rent money from other people, which is effectively what borrowing is, you invite them into your life. They can make demands on your future output. They can cause you tremendous hardship if you break your promise. Attending your dream school isn't worth spending the next 15 or 20 years of your life in what amounts to servitude, existing only for the pleasure of the shareholders of Sallie Mae, Navient, Citigroup, and Wells Fargo. Diversify your income sources and your assets. Everyone talks about asset diversification but income diversification is just as important. Life is much better, and much less stressful when you have multiple streams of income coming in so you don't rely on any particular one of them. Never invest in something you don't understand and never invest money you can't afford to lose. One might go so far as to call the latter the most important rule of investing. Let your money compound for as long as possible. Crazy things happen when you pass the 25-year mark. Case in point: Mere historically average rates of return will produce 1,000% gains over that time horizon. Get it up to 50 years, and you're looking at 10,000%. Of course, there's no guarantee the past will repeat the future and investing always holds the potential for severe, if not permanent, losses - just ask investors in Austria between 1900 and the present due in no small part to the annexation of the country by Nazi Germany during World War II - but it's not hard to understand the reason compounding has been called the eighth wonder of the world. Case in point: Mere historically average rates of return will produce 1,000% gains over that time horizon. Get it up to 50 years, and you're looking at 10,000%. Of course, there's no guarantee the past will repeat the future and investing always holds the potential for severe, if not permanent, losses - just ask investors in Austria between 1900 and the present due in no small part to the annexation of the country by Nazi Germany during World War II - but it's not hard to understand the reason compounding has been called the eighth wonder of the world. Start investing as early as you can in life. Live as long as you can. That means putting your health first. Follow your doctor's advice, which almost always amounts to: Don't smoke. Don't drink. Don't do drugs. Don't be obese. Don't operate heavy farm equipment while on prescription medication. Always wear your seatbelt. That pretty much covers all of your bases to the degree things can be controlled. Even an extra five years can be magical once you've built a hefty portfolio. As simple as it sounds, that's the crux of the wealth building process. Put the right things in motion, be, in the words of billionaire Charles Munger, "consistently not stupid," and your money takes on a life of its own, expanding, growing to the sky, showering you and your children with prosperity. In the short term - and anything under five years is short-term - the rest of it is noise.